Sometimes, it takes just the right piece of artwork to represent the qualities of your loved one that you’ll always cherish. 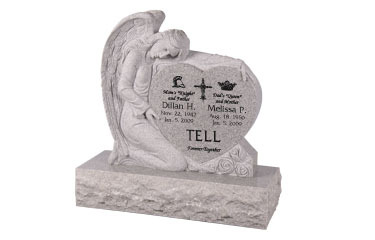 Find a gravemarker here in our extensive monument catalog. And, if you don’t see exactly what you want, Call or Email us - we can special order almost anything. The price you see is the price you pay. 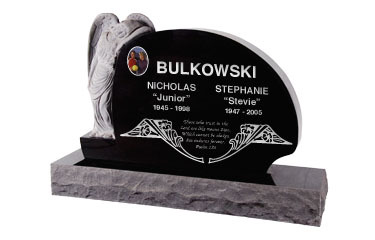 All of our Gravemarkers, Headstones, Tombstones and Monuments include unlimited engraving and free shipping to anywhere within the Continental United States (Shippping to Alaska and Hawaii for an Additional Charge). Extra services such as photo engraving and ceramic photo’s are also available for an additional charge. 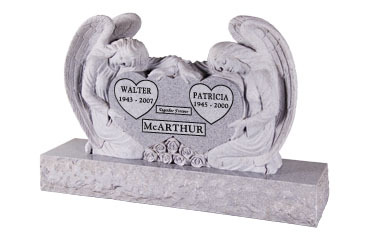 Because these Gravemarkers vary in size, not all can be ordered through our On-line Gravemarker Designer. 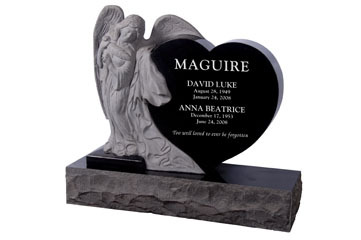 Select the Style of Headstone or Memorial that you would like. Provide us with your information, artwork and font selection. Pay for your stone, After purchase a personal designer will be assigned to help you complete your order. A final proof will be provided to you for your approval. This carved Angel holds a large heart. It is all polished to allow for complete custom carving. The base is 40" wide. These carved Angels hold large hearts. It is all polished to allow for complete custom carving. The base is 60" wide. This carved Angel leans against a heart. It is all polished to allow for complete custom carving. The base is 48" wide. 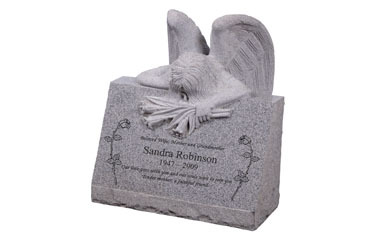 This carved Angel rests on a sloped granite die. It is all polished to allow for complete custom carving. The base is 66" wide. Carved angel rests across the top of the slant.